Our range of products include roti making machine, paratha making machine and poori making machine. The stainless structure of Roti Making Machine gives it a sturdy look and feel. The machine has perfect dimensions to dispense perfect round breads. They are perfect for commercial settings that need mass production of chapatis or round breads. They have a broad range of application and can fit in to the specific client requirements. We check the machine for perfect symmetry to provide the best solutions. 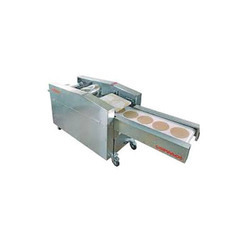 In series of delivering an exceptional product line, we offer technically advanced array of Paratha Making Machine. Our entire product range is manufactured using quality assured raw components and advanced technologies. Paratha Making Machine ensures noiseless operations and is reliable in nature. With the extended support of our skilled professionals, we are engaged in presenting a wide range of Poori Making Machine. Offered Poori Making Machine is widely used in hotels, restaurant, hospitals and many other places. Offered range of this Poori Making Machine is widely used in market for its availability in affordable price range.